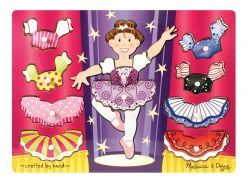 Description: Change the ballerina into her next costume for the big number. Each removable wooden puzzle piece on the peek-a-boo puzzle is hiding a special full-color illustration underneath. Tell a story, play a guessing game, or find the hidden pictures!